It’s that time of year… school has been in session a few weeks and we’re back in the daily grind: Get up, make breakfast and lunches, rush out the door for school, eat dinner, do homework, take showers, go to bed. The kids are exhausted already and so am I, and it’s only September. I’ve been wondering how I’m going to make it through the rest of this year. How are we going to make it through the next fifteen years?! 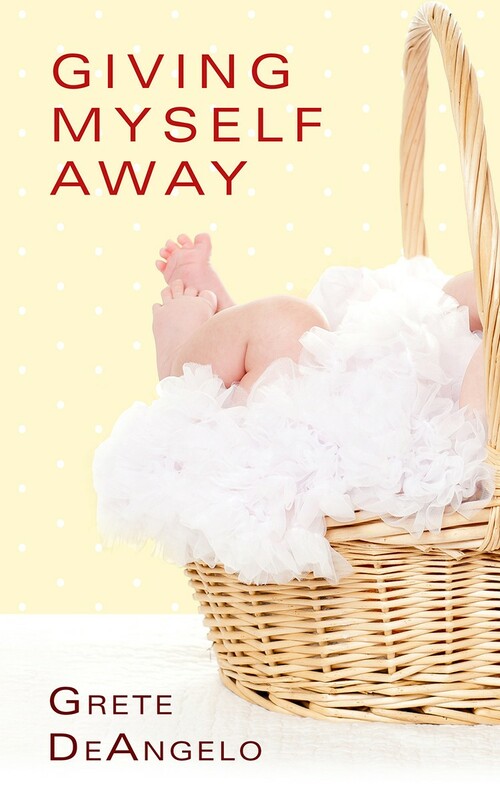 I find myself reaching for all of the “momisms” of my youth – those sayings that were repeated often in our house and became the backdrop of our daily life. In honor of my mom’s birthday today, I’m going to share a few gems from our house. “Lord, give me the strength to raise four children.” This was not so much directed at us, the four darling children, but muttered as a plea to get through whatever we happened to be doing to exhaust our dear mother. I’m only raising two and I have the same feeling. I pray for strength on a regular basis. “A family is a warm, safe, loving environment.” My mother said this whenever one of us was picking on a sibling. My brothers drove me to the point of tears at times and I remember often telling my parents that I wished I were an only child, but now that we’re grown, I don’t know what I’d do without my brothers. We are scattered over three states and don’t see each other all that often, but I know they have my back and I can call them anytime. When my boys are arguing, I remind them that they’re going to be friends someday, believe it or not. If my mom wanted to embarrass us and drive us out of the room, she’d amp it up by talking about “the bosom of the family.” Yuck! “Only boring people get bored.” I hated to hear this. It didn’t make me stop feeling bored. All it did was irritate me. And wouldn’t you know it, now I say it regularly to my kids. I never have time to feel bored anymore, so I can see why my mom wasn’t too sympathetic to my plight. “Fight sweetly, children.” This one came from my soft-spoken, genteel grandmother. My dad said he and his brother got along great, so I wonder why their mother ever had to say this? Hmmm…. “Go play in traffic.” This was technically from my dad, but I had to include it because we heard it quite often. My dad didn’t join in often with the trite sayings, but we heard this whenever our parents practiced that vile technique of ganging up on us. They were still outnumbered four to two, but it was much harder to get away with anything when they were both alert and paying attention to our misbehavior at the same time. These tried-and-true phrases are very familiar in my own household because when I get tired, they just pop right out, no matter how much I vowed as a kid that I would never say such lame things to my children. I’d like to leave you with this very funny video of a mom who’s managed to say everything that every mom has ever said to her kids. What are the momisms you grew up with? I decided this was the summer that my sons would learn to cut the grass. They would take over a job I’ve been doing since I was 12. It’s a task that’s half tedious and annoying, half meditative and relaxing. I’ve been looking forward for years to pass the reins. My younger son embraced the challenge, but he’s an independent type, one who doesn’t like to be told “the best way” to do something, even if he’s never done it himself. Therefore, there are little mohawks and tufts of grass that didn’t get cut because my directive to overlap each row went unheeded. The tracks run a criss-cross haphazard path rather than the orderly farmer’s rows I create each time I go out to mow. As I watched him work, growing impatient at times to be finished (how I know the way that last twenty minutes seems to drag out! ), getting frustrated when he got into corners it was hard to get out of, and altogether missing a few areas, I thought how much easier it would be to do it myself. I could keep cutting the grass — it’s only an hour a week, and only for those few precious months of summer. 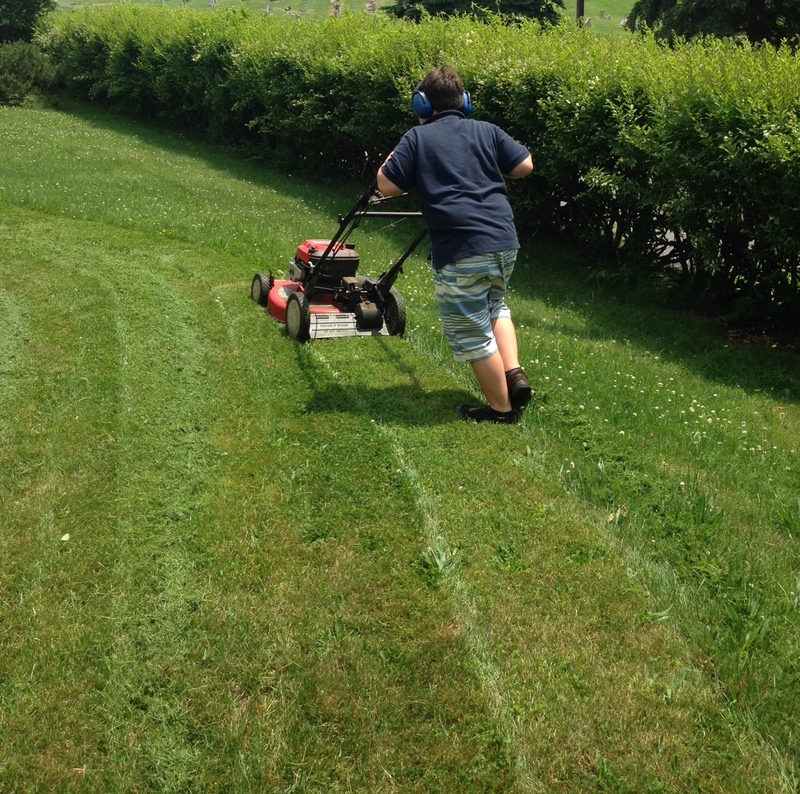 I could do it myself and look out my windows at a yard mowed by someone with years of experience, or I could put my perfectionism aside for the more important goal of seeing my son learn how to do something better with practice (there were fewer mohawks the second time). I can appreciate his pluckiness – even though his arm isn’t quite long enough yet, he wants to try to start the mower himself each time. I don’t even remember how I learned to cut the grass. Knowing my dad, he probably just sent me out and said “figure it out,” which is how I got so good at doing a lot of different things. I can show my son that I have that same confidence in him that my parents had in me. When my sons do a cleanup job that wastes paper towels, at least they are cleaning up, and when the grass isn’t cut perfectly, it’s still getting cut, and that’s good enough for me. This is me enjoying one of those bittersweet cuddle moments with my boys that I never want to forget. They are letting go and I am letting them let go, because I know they need to. The other day when I picked up my ten-year-old son from the school bus stop, he looked preoccupied. “There’s something I wanted to tell you, but I can’t because I promised my friend,” he said. I asked him a few questions about whether he was in trouble, the friend was in trouble, or it was something I really should know, but beyond a few vague reassurances, he clearly wasn’t going to tell me more. I felt conflicted: proud of him for keeping his word, but sad that he is reaching the age where his relationship with his friends is growing more central than his relationship with his parents. I remember being a teenager with three younger brothers and feeling like my inner thoughts were the only privacy I had sometimes. I used to look out the car window and daydream and feel smug that no one else knew what kinds of things I was thinking about. Most of the thoughts were about hopes and dreams, things I wanted to accomplish, stuff about my friends, and of course, boys I thought were cute. I didn’t spend too much time thinking about my family during those years. Maybe you could say it’s a good thing I was able to take them for granted in that ways. Parents with older kids have told me to enjoy all the hugs and cuddling and hand holding and talking that my kids want to share with me now. As we all get swept up in everyday life, I try to stop and remember to hug my boys. I’m happy they’re growing up. And sad. You know what I mean. Happy Mother’s Day to all you mothers whose hearts are bursting and breaking all at the same time.